From the website Australians At Work. Video clip synopsis – Aboriginal People in the Gibson Desert is an excerpt from the film Desert People (51 mins), produced in 1966. In 1966 a few Aboriginal families were living nomadic lives in the heart of Australia's Gibson Desert. Broadband MP4 desert_bb.mp4 (7.1MB), suitable for iPods and computer downloads. 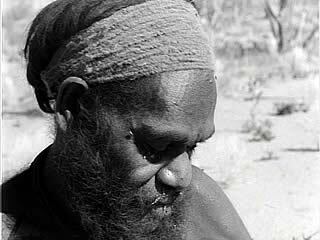 Aboriginal People in the Gibson Desert is an excerpt from the film Desert People (51 mins), produced in 1966. Desert People: When this film was made, there was still a handful of family groups living a nomadic life somewhere in the heart of the Gibson Desert. Desert People tells of a day in the life of two such families. Djagamara and his family were filmed where they had camped, beside an unusually plentiful supply of water in an otherwise dry creek bed at Badjar in the Clutterbuck Hills. Minma and his family were taken back to Minma’s country from Warburton Mission to record how they had lived until just a few months before. This extraordinary film offers a rich experience of Aboriginal culture as the families share their traditional knowledge. People Of The Australian Western Desert: In 1965 and 1967, the Australian Institute of Aboriginal Studies sponsored film trips by the then Australian Commonwealth Film Unit (now Film Australia) to the Western Desert region of Australia. The object of these trips was to film the daily life of nomadic Aboriginal people living in the Gibson Desert of central Australia. Although this land is one of the most arid regions of Australia, the people who lived there regarded it as rich in resources. In the 1960s a film crew made an *ethnographic record of the dwindling *Indigenous population of the Gibson desert area. Indigenous people had lived in the area for thousands of years in a traditional way, before the destruction of that way of life in the late twentieth century. What may have caused this population reduction? What attitude do you think the narrator has to the people featured in the clip and the way they live? Explain your response. Imagine that you are part of the film crew. Are there any special ethical considerations that you think would need to be observed? For example, what might happen if you left behind examples of non-traditional technology, such as metal axes? Or if you arranged for plane food drops? Aboriginal and non-Aboriginal perspectives of the relationship between land and country vary. What evidence is there in the film of this relationship for the Aboriginal family? Why may have Minma and his family been living in a mission and not Djagamara’s family? Consider the different kind of life Djagamara and his family would have on a mission compared to their traditional nomadic life. What aspects of his family may be disapproved of by the mission personnel? The Europeans running the mission would consider Minma and his family’s new life style preferable to that of Djagamaras. Why would they hold that view. How important are such film clips as this one on the people of the Western Desert today? Explain.